This is one unwanted visitor from Mexico that even Donald Trump’s fabled wall could never stop. And it’s a dire threat to local, state and national fruit growers and consumers. A portion of San Diego County has been placed under quarantine for the Mexican fruit fly following the detection of seven Mexflies within the City of Encinitas. The United States Department of Agriculture (USDA), the San Diego County Agricultural Commissioner, and the California Department of Food and Agriculture (CDFA) are working collaboratively on this project. All host fruit grown within the quarantine area must be treated or processed before being sold. All nursey plants with host fruit must be treated or placed off sale. The quarantine will also affect local residents – home gardeners are urged to consume homegrown produce on site and not move it from their property. 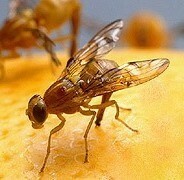 Sterile male Mexican fruit flies will be released in the area as part of the eradication effort. The release rate will be 325,000 males per square mile per week in an area up to 50 square miles around the infestation. Sterile male flies mate with fertile female flies in the natural environment but produce no offspring. The Mexican fruit fly population decreases as the wild flies reach the end of their natural life span with no offspring to replace them, ultimately resulting in the eradication of the pest. In addition, properties within 200 meters of detections are being treated with an organic formulation of Spinosad, which originates from naturally-occurring bacteria, in order to remove any mated female fruit flies and reduce the density of the population. The eradication approach used in the Encinitas area is the standard program used by CDFA and it’s the safest, most effective and efficient response program available. The quarantine will affect anyone who grows, sells, or gives fruit or plants away to others. This includes growers, wholesalers, and retailers of susceptible fruit in the area as well as nurseries that grow and sell Mexican fruit fly host plants. These actions protect against the spread of the infestation to nearby regions where it could affect California’s food supply and our backyard gardens and landscapes. The Mexican fruit fly can lay their eggs in and infest more than 50 types of fruits and vegetables, causing severe impacts on California agricultural exports and backyard gardens alike. Five wild adult flies, a mated female or immature stage will result in a quarantine. Other resources include the pest profile at: www.cdfa.ca.gov/plant/go/MexFly. Residents who believe their fruits and vegetables are infested with fruit fly larvae are encouraged to call the state’s toll-free Pest Hotline at 1-800-491-1899. While fruit flies and other invasive species that threaten California’s crops and natural environment are sometimes detected in agricultural areas, the vast majority are found in urban and suburban communities. The most common pathway for these invasive species to enter our state is by “hitchhiking” in fruits and vegetables brought back illegally by travelers as they return from infested regions of the world. To help protect California’s agriculture and natural resources, CDFA urges travelers to follow the Don’t Pack a Pest program guidelines (www.dontpackapest.com). Be the first to comment on "Hang on to your fruit – invasive Mexfly back"